Did you know that the Energy Independence and Security Act of 2007 laid out a phased approach to rid our homes of inefficient incandescent light bulbs? If you didn’t, you’re not alone. According to the latest Sylvania Socket Survey, only four in ten respondents knew that the government, having already eliminated 100-watt and 75-watt incandescent light bulbs (in 2012 and 2013, respectively), made 60-watt and 40-watt light bulbs disappear from store shelves as of January 1st, 2014. For those that were aware, an estimated 30% will be hoarding 60-watt and 40-watt light bulbs. Is it time for you to hoard as well? Many of us – myself included – have lit our homes with incandescent lightbulbs, technology that’s 100-plus years old. As I found out when shopping for new light bulbs, there are now some great incandescent alternatives to consider. So no hoarding required. The Compact Fluorescent Lamp (CFL) was invented in 1976 and became commercially available in 1995. The light is slow to warm up, and the mercury-laden product requires special disposal. Low upfront cost: A pack of eight 60-watt equivalent CFLs is $10.50 or $1.31 each. 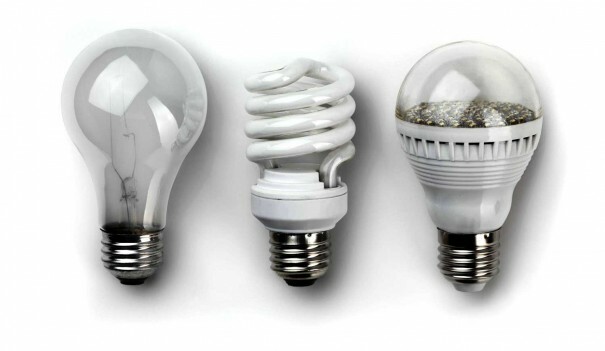 Personally, my experience with CFLs is that the bulbs fail prematurely after a year or two. Efficiency: Uses up to 75% less energy than incandescents. The Light-Emitting Diode (LED) was invented in 1962 has been used in electronic equipment for decades. Mass installation of LEDs began in 2008. Highest upfront cost: One 60-watt equivalent LED is $13 (a year ago they were $40-$50). However, an LED is the longest lasting at up to 25 years. It can be put in a newborn’s bedroom table lamp and last until their college graduation. Efficiency: Uses up to 80% less energy than incandescents. Wait, weren’t incandescents phased out? Yes, the inefficient ones. There will still be incandescent light bulbs available to purchase, but the government has required them to be at least 28% more efficient. These newer incandescents are sometimes referred to as halogen incandescents. High upfront cost: GE now manufactures a 60-watt equivalent light bulb that draws 43 watts (that’s 28.34% more efficient). A pack of four light bulbs is $9.67 or $2.42 each. Efficiency: Uses up to 30% less energy than incandescents. According to Noah Horowitz, Director of the Center for Energy Efficiency for the Natural Resource Defense Council, once we transition completely away from the old incandescents we’ll save $13 billion on our utility bills. That means switching to any of the three options above is an improvement, but the best choice is LED such as the $13 Cree LED. 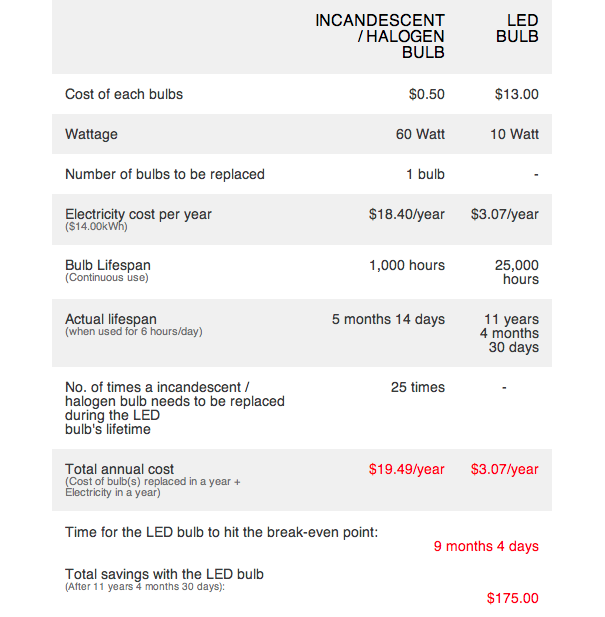 They’re more expensive than the halogen incandescents and CFLs, but they last the longest and use the least amount of energy, saving you the most everyday dollars. We’re at a moment in time when consumers are contemplating lighting for the first time ever. While we may find the move from our trusty yet inefficient incandescent light bulbs to CFLs or LEDs difficult, the energy efficiency and cost savings are tangible benefits. Happy lighting!